Rams ride big plays to take control of Class B crossover game. OAKLAND — Two teams that pride themselves on methodical and physical football grounded in the running game found themselves separated by only a pair of big plays Friday night. Kennebunk’s Derek Smith returned a kickoff 86 yards for a touchdown and teammate Jake Littlefield broke off a 65-yard scoring run on the second play of the second half, lifting the Rams to a 32-7 win over Messalonskee at Veterans Field. Littlefield, a senior fullback, rushed for a pair of touchdowns in the win. Kennebunk, which played for the Class B state championship last season, improved to 2-0. 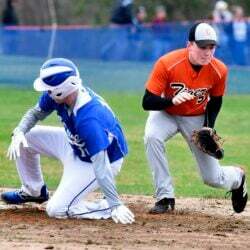 Messalonskee, which beat reigning state champ Brunswick in its opener, fell to 1-1. Kennebunk jumped out to an early 12-0 lead in the first quarter, thanks to a 3-yard run from junior Cam Lovejoy in its first possession and Littlefield’s 6-yard score following Messalonskee’s second straight three-and-out to open the game. 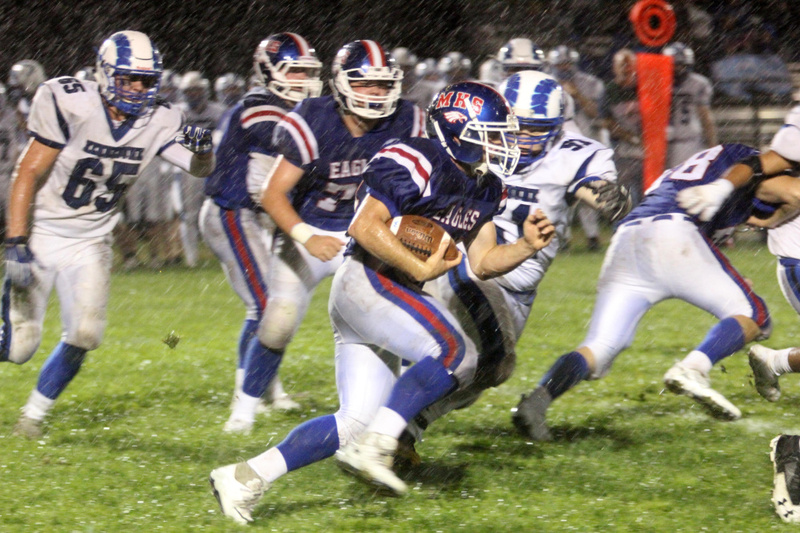 But the Eagles found some life with 1:35 remaining in the opening period, when senior back Tyler Lewis broke off a 44-yard touchdown run to pull the home team to within 12-7. It took just 12 seconds for the Kennebunk lead to balloon once again. That’s just what the junior Smith did, taking advantage of some good blocking and some sizable holes to race virtually untouched to a 20-7 lead. 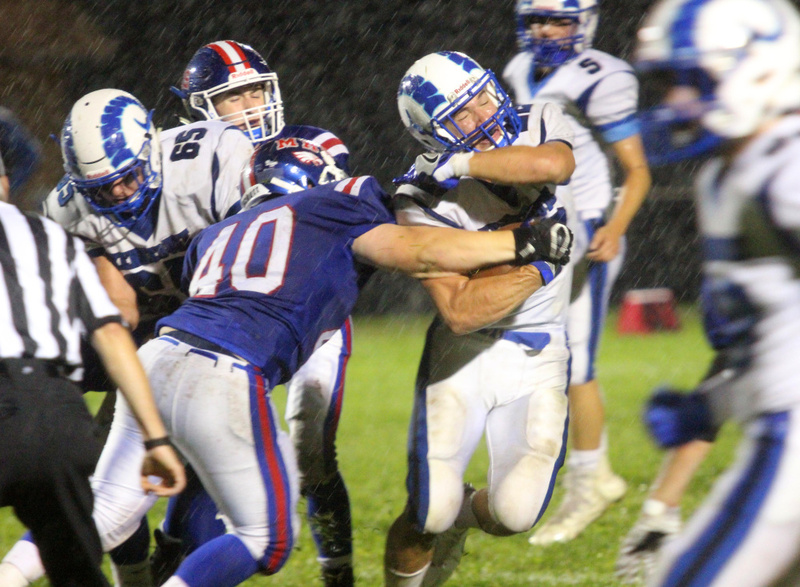 Messalonskee finally found some rhythm on offense, but for a running game that relies on efficient marches, the two-score deficit and the driving rainstorm that arrived in the first quarter and never subsided proved too much to overcome. After Littlefield’s second touchdown of the night made it a 26-7 game, Messalonskee was at its best. 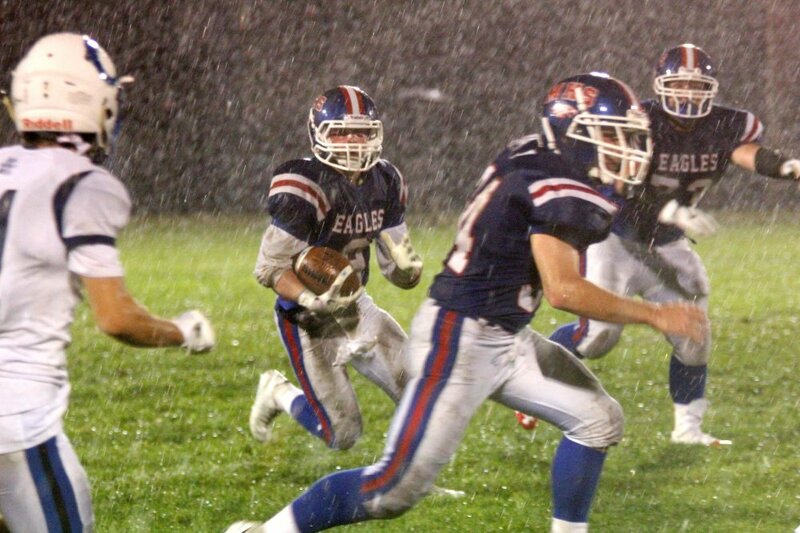 The Eagles had the ball for more than nine and a half minutes on their only drive of the third quarter, twice converting on fourth down — once near midfield on an Austin Pelletier run and later deep in Ram territory on sophomore Deklan Thurston’s fourth-and-inches quarterback keeper — but they couldn’t come up with any points. The drive stalled at the Kennebunk 14, when Thurston was sacked while rolling right trying to keep the momentum going. Kennebunk’s offense sealed things with another long march, this one in the fourth quarter, capped by junior tight end Dante Delorenzo’s 1-yard plunge for a 32-7 lead.